We’ve surpassed our goal of 10,000 letters sent by BC residents! Extensive logging in the Sarita River watershed. Note the clearcut extending nearly to the edge of the river. 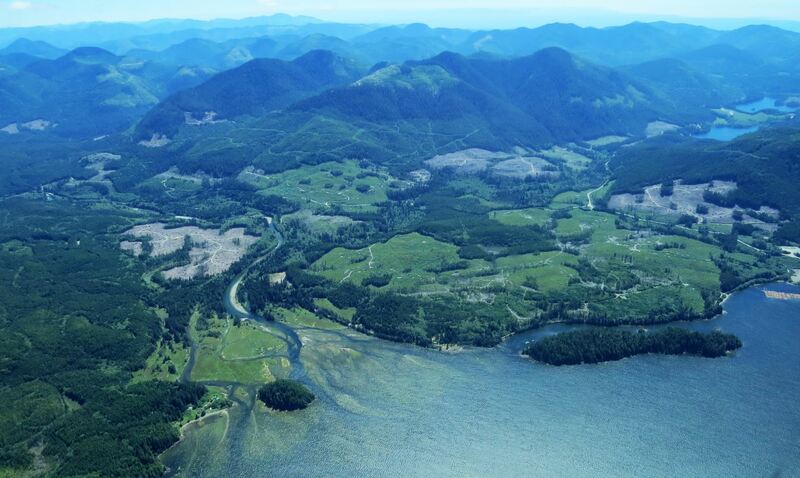 The international call for protection is echoed by tens of thousands of British Columbia residents who have already signed petitions launched by Sierra Club BC, the Wilderness Committee the Ancient Forest Alliance and Leadnow. Rainforest Rescue spokesperson Mathias Rittgerott pointed out that the ongoing destruction of BC’s ancient rainforest undermines the positive image of Canada internationally—particularly the shocking fact that Vancouver Island’s last old-growth rainforest is being destroyed faster than in rainforests in tropical countries. 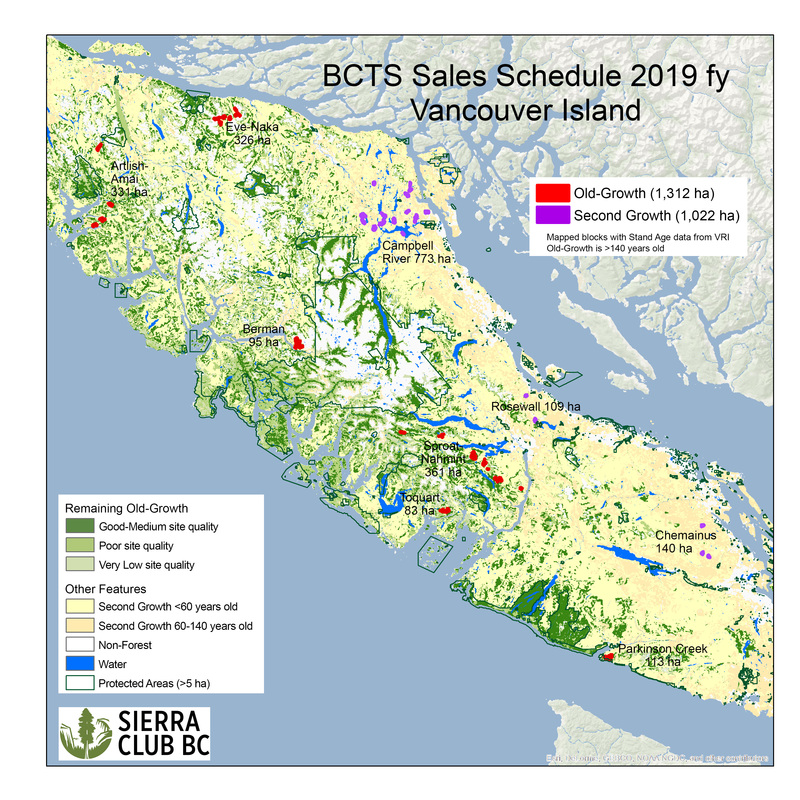 The international call for action and the ongoing clearcutting this old-growth rainforest worry Island tourism operators and experts. 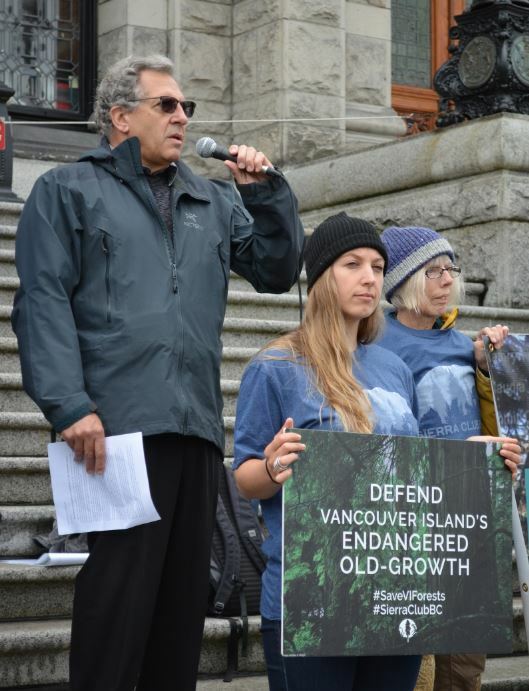 At the petition delivery, Scott Benton of the Wilderness Tourism Association of BC expressed significant concern that opportunities to experience old-growth forests are becoming increasingly rare in BC and particularly on Vancouver Island. Scott Benton of the Wilderness Tourism Association of BC speaks about importance of ancient forests to tourism operators in BC. To his right, Oriana Smy of Outer Shores Expeditions joins in the call for protection. Watch a livestream of the petition delivery here. Brian White, Professor at the Royal Roads University School of Tourism and Hospitality, said he is seeing growing disappointment and disbelief among tourists, who see the devastation of old-growth forests on social media. Vancouver Island has a reputation as a world class tourism destination partly due to its magnificent ancient forests, but this reputation is getting damaged and this has an impact on tourism businesses. City of Victoria Councillor Laurel Collins pointed out that if the provincial government is serious about protecting species habitat and water, meeting climate targets, and supporting long term jobs in resource based sectors and tourism in rural communities, it must protect endangered ancient rainforest. In addition to jeopardizing BC’s tourism economy, the destruction of BC’s globally rare, endangered old-growth rainforests also threatens biodiversity and Indigenous cultural values. These big trees provide some of the best carbon sinks on the planet and irreplaceable long term economic value for tourism, recreation and businesses seeking locations with a high quality of life. The NDP’s 2017 election platform included a commitment to act for old-growth, promising to take “an evidence-based scientific approach and use the ecosystem-based management of the Great Bear Rainforest as a model.” Following through on this promise would benefit the well-being of communities, biodiversity, clean air and water, long term forestry jobs and one of the world’s most efficient carbon sinks. But one year into taking power, the BC government has not yet taken any meaningful steps to protect endangered coastal and inland old-growth ecosystems outside the Great Bear Rainforest. 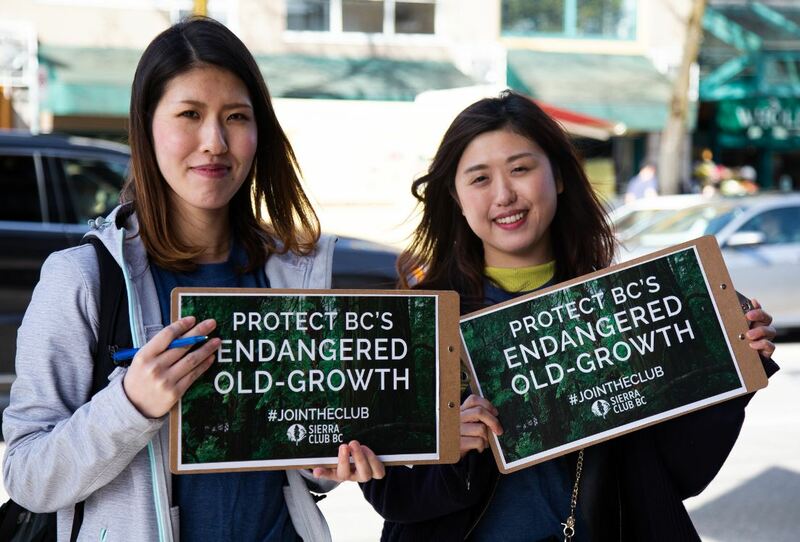 Sierra Club BC asked the BC government to receive the petition two days earlier. The petition was received by Forest Minister Doug Donaldson’s assistant without offering any comment. We take this as another signal that the provincial government does not take the old-growth forest crisis very seriously and that it will take a lot more pressure from British Columbians to change this. We are committed to building strong support for protecting old-growth forests with our call for action at www.rainforestisland.ca. Please join us in the fight. We are pleased to invite you to join Sierra Club BC as we participate in the GVAT potluck series. We are pleased to invite Sierra Club BC members to a pre-film gathering on October 10 at the West Coast Grill (Prestige Oceanfront) from 5-6:30 in Sooke.